"Civilization needs a new operating system, you are the programmers, and we need it within a few decades." We live in a time of flux. The operating systems that guided human development in the 20th century are failing. Too many people still struggle for access to food or education. Few societies have been able to organize for broadly shared benefits. Moreover, in our growing demand for nature’s services, we weaken our ability to provide for human needs in years to come. It’s time to examine how our current operating systems — the institutions of social, political, and economic relations — leave us vulnerable. Then we can begin to draw a new map for navigating the territory ahead. While individual maps may differ, a set of core principles for developing 21st-century institutions is common to us all. They are the principles of resilience. Stated simply, human resilience is the capacity to effectively influence and adapt to change. Through a culture of resilience, we cultivate the potential for novelty, institutional innovation, and social transformation. As our maps should reflect, humans are dependent on natural resources and services for food, water, energy, and other basic needs. In the language of resilience, we exist within linked social-ecological systems — and these relationships matter. Within social-ecological relationships, the scale of activities matters as well. Globalization fosters greater connectivity and efficiencies, at the expense of redundancy, diversity, and social capital. As a result, our societies are more vulnerable to shocks from natural disasters, resource scarcities, climate change, financial disruptions, disease, infrastructure failures, and social unrest. To counter these vulnerabilities, we look to scales that better approximate the contours of the natural and cultural landscapes in which people live, work, and organize — regional scales, in which societies can more reliably steward nature’s services and provide for human wellbeing. 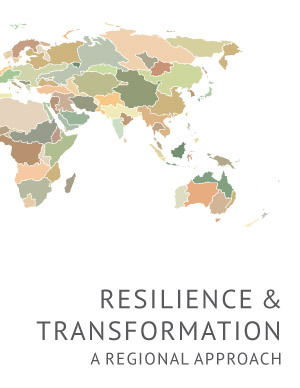 Greater diversity and viability of local and regional economies is key to bolstering resilience. In this publication, we explore a culture of resilience, examine current vulnerabilities in our home region along the West Coast of North America, and present stories of how individuals and organizations are changing the nature of social, political, and economic interactions. Although our focus is on regional scales, our vision is hardly regionally bounded. National and international regimes are stuck in maladaptive traps: entrenched ways of thinking, acting, and organizing. We believe that the innovation that emerges at local and regional scales can lead to large-scale transformation. We start with resilience at home in order to develop institutions that better support personal, social, and natural wellbeing for everyone.